There are some recipes that are just so good, I have to write them down somewhere so I don’t forget them. This is one of them. I made it today and I’m already dreaming of its heavenly taste. 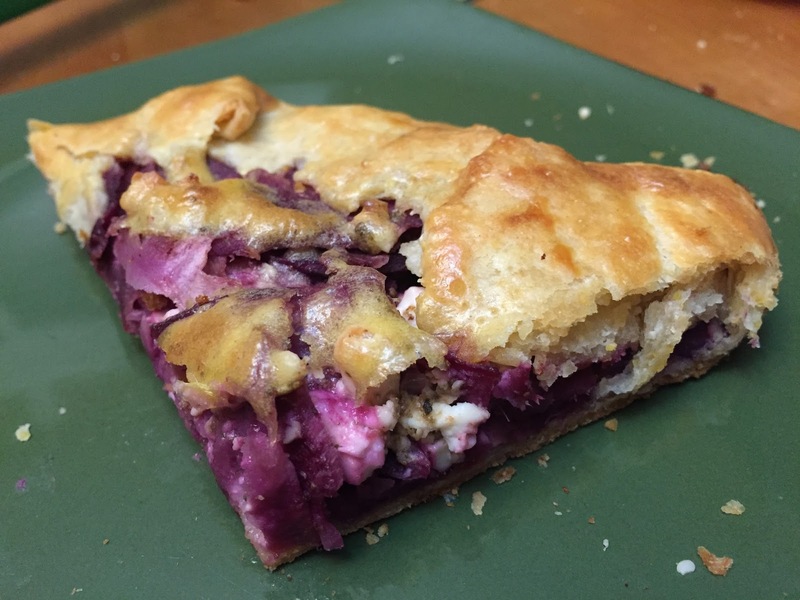 The striking purple color from the purple sweet potatoes and red onion doesn’t hurt either. The recipe for the galette dough is here. 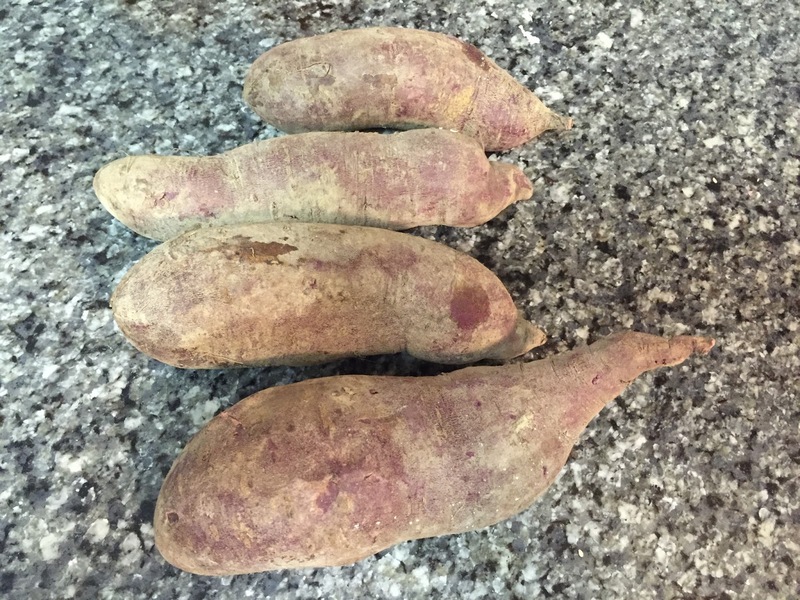 The recipe for the sweet potato and red onion filling is here. 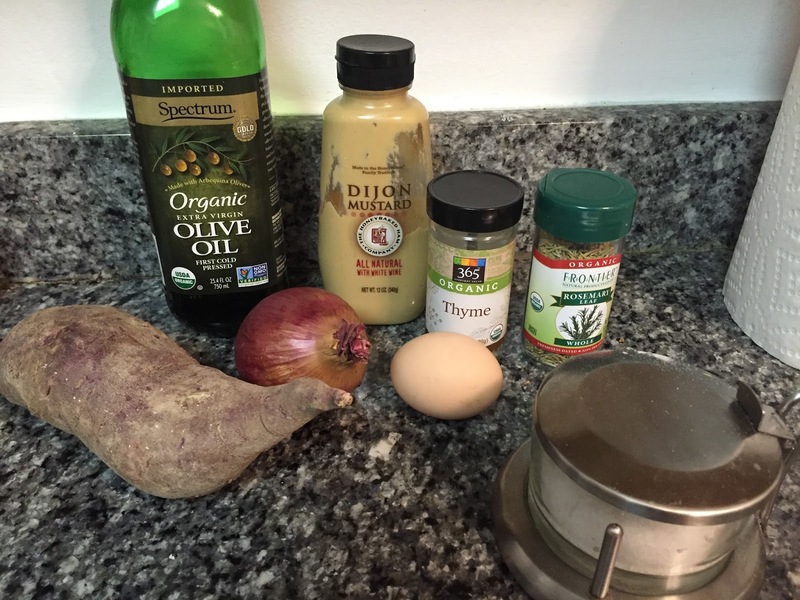 I changed the order of ingredients, used purple sweet potatoes instead of regular, and modified the glaze recipe. This recipe makes two galettes, about 6 inches around. One galette serves two people or one large, very hungry person. 1. In a large bowl, whisk together the flour, cornmeal, sugar and salt. Set aside. 2. In a small bowl, mix together the yogurt and ice water. Set aside. 3. Add the grated butter to the flour mixture and toss to incorporate. Add the ice water and yogurt mixture a little at a time until you can form a ball with the dough. 4. Divide the dough in half, make each into a small disk, wrap tightly in plastic wrap and store in the refrigerator for 2 hours or overnight. 1. Preheat the oven to 400 degrees F. Slice the sweet potato and red onion into very thin slices using a box grater or a mandoline slicer. Throw the pieces into cold water so they don’t dry out. 2. Grind together the thyme, rosemary, salt and garlic to form a paste. In a large bowl, mix together the herbs and feta until well-distributed. 3. Drain the sweet potato and red onion and add to the feta mixture. Toss to coat. 1. Take both doughs out of the refrigerator and remove from the plastic wrap. 2. Roll each dough out separately on a floured surface until it is about 1/8 inch thick. Transfer the dough to a baking sheet covered with parchment paper. 3. Pile the middle with the sweet potato filling, leaving about 1.5 inches of dough in a border all around. Carefully fold the edges of dough over the filling, creating pleats in the dough. 1. Whisk together the oil, mustard and egg until smooth. Lightly brush the glaze over the entire galette, both the dough and the filling. 2. Bake the galette for 20-25 minutes until the crust is a lovely dark brown. 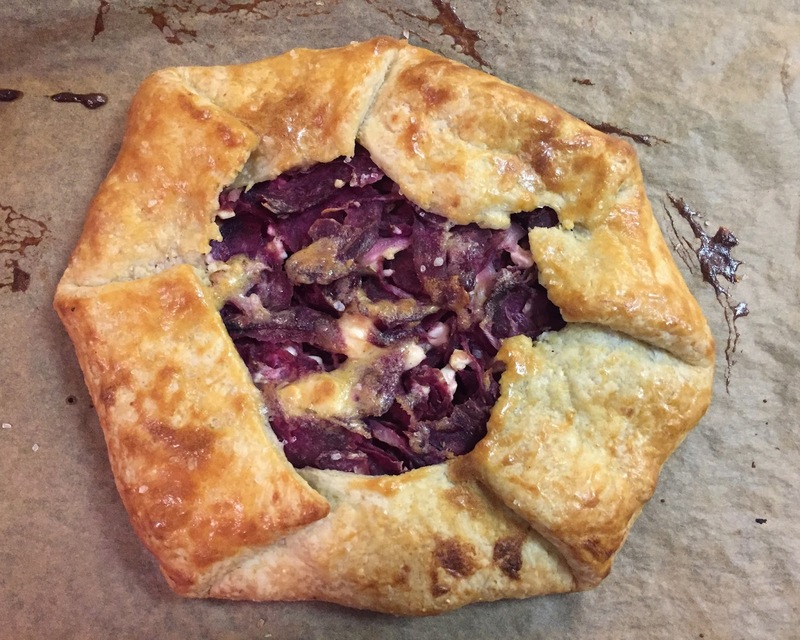 Let the galette rest for about ten minutes before eating. Even Mr. Bread Maiden, who typically doesn’t consider a meal “dinner” unless it has some sort of meat, really liked this galette. Which is good, because I picked a large sweet potato to use and now we have tons of filling left over.